Excellent book detailing the final battle and days of "Stonewall" Jackson's life and his continuing legacy. This is not intended to be a comprehensive book about the general's life or the Battle of Chancellorsville, but it thoroughly covers the topic it addresses.The text is easy to read and there are many photographs and illustrations throughout the book. I especially enjoyed the short essays in the appendix, discussing staff officers, Jackson's pre-war life, and myths.Highly recommended for Civil War history buffs or researchers looking for a details account of Jackson's role at Chancellorsville, his medical care, death, and legacy. Also of particular interest is Chris Mackowski and Kristopher D. White's The Last Days of Stonewall Jackson: The Mortal Wounding of the Confederacy's Greatest Icon part of Savas Beatie's engaging "Emerging Civil War Series." While as not as in-depth as Dr. Lively's book, Mackowski and White's study is still an engaging read and deserves a place on the shelf of every reader fascinated by the Civil War. Of particular note is the differing interpretations of the number of times Jackson fell from his stretcher--clearly the debate is still being waged. Where The Last Days of Stonewall stood out for me was the covering of the history of Fairfield Plantation and the Chandler family which called the place home. The appendices at the end are of particular note with thoughtful essays on Jackson's legacy and the history of the markers commemorating Jackson's wounding and amputated arm. 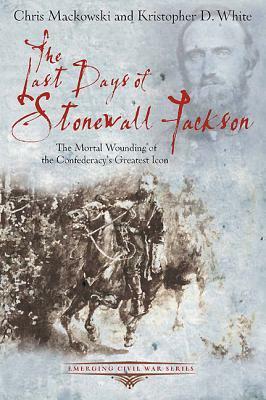 Very good historical read of the last days of Thomas Jonathan "Stonewall" Jackson. It provides very good historical reference and context to his death. Lastly, it gives a personal touch when it includes varies quotes from Stonewall, Mrs. Jackson, and his officers/doctors. Answers great historical questions and provides great detail of Jackson and his death. Really enjoyed the book! A brief, well-illustrated accounting of Jackson's last days. Not as in-depth as Calamity at Chancellorsville, released at the same time by the same publisher. A lively and engaging book on a subject I didn't have much interest in - until I read this book.